War Law is the mass combat system for ICE's Rolemaster system. With War Law a GM can make numerous detailed decisions for every aspect of battles that can have anywhere from 2 to 1000's of participants. However, War Law also includes a very specific, simplified version of this battle system that makes standard decisions for many of the key battle system aspects (e.g., scale, unit size, abstracted losses, unit integrity, morale, etc.). This simplified version does not require a GM to use — it is a fully functional boardgame. 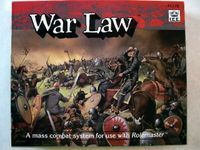 War Law has everything you need to make your Rolemaster battles something that will enrich the sagas and legends of your campaign for centuries to come. • A `unit attack table' for each of the basic RM attack tables, so that weapon attacks made by groups of combatants will statistically approximate normal RM results.